In a lot of ways, Colt Express plays like a My First Programmed Movement Game, and that’s not meant as a dig. Leaving aside the game’s definite toy factor… though actually let’s not, because it comes with a 3D train! And little cactus and animal skull standees, for no reason other than because they look cool! 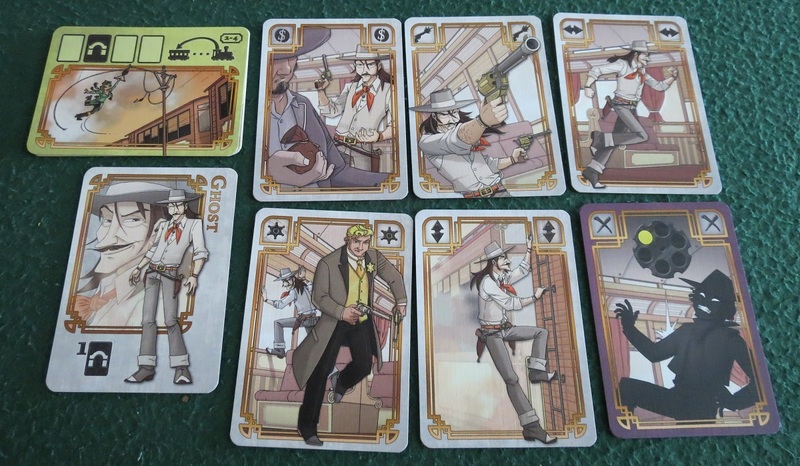 But yes, leaving that aside, Colt Express casts you as a pack of Western-themed archetypes — the scarred Tuco, the cleavage-baring Belle, the broad-shouldered, dark, and handsome Django, the super pasty gunslinger Ghost (being pasty is a Western archetype?) — and then sets you loose to rob the train, nabbing as many valuables off the passengers as possible before it slides into the station. Whichever outlaw disembarks with the most, making sure to count the bragging rights bonus for whoever shot off the most bullets, wins the game. This is done by programming your moves in advance, assembling with your opponents a deck of cards that represents all the characters moving, climbing between roof and car, shooting, and stealing cash. The climax of each round is the moment when you flip that deck over and resolve each action one at a time, often watching in dismay as the moves you saw in your head utterly fail to align with reality. You pictured yourself stealing the $1000 lock box and climbing up to the roof to escape danger, and instead your gunslinger reels from getting punched by a fellow outlaw, stumbles into the marshal, gets shot, escapes to the roof, and then climbs back down into the car and gets shot by the marshal again. Ghost’s hand of cards — been shot once. 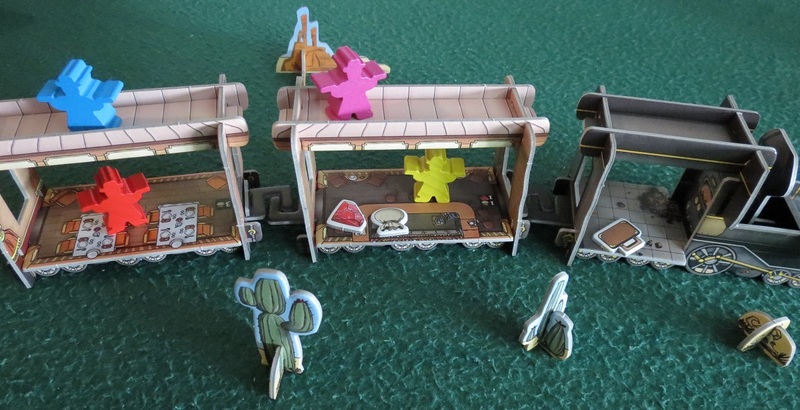 There are a few things that make Colt Express run more smoothly than a train in the Old West ever had a chance to. First of all, since all the outlaws are in this for number one, you end up spending as much time eyeballing your fellow pistoleers as you are planning your own moves. There’s no reason to move up two cars and pluck the gem hanging around that pretty missus’s neck if Doc is going to get to her first. Sounds simple enough. Then again, the whole enterprise is complicated by a few extra factors. The first is that your moves aren’t entirely set in stone once they’re played. While a “move” is still a “move” and a “shoot” never turns into a “punch,” each option tends to give you some leeway when they’re resolved. And most of them behave differently on the roof and inside the railcars themselves. For instance, if you move around inside the train, you can travel one car in either direction, maybe even opting to back up so as to avoid an upcoming punch or pursue loot elsewhere. And if you played that very same move card on the roof, you can run and leap up to three cars away, though then of course you’ll have to spend a turn climbing back into the train if you want to steal more cash. It doesn’t take too long to figure out that being inside and being on the roof both bring different advantages and dangers. Outside you’re more likely to get shot, since there aren’t any walls and/or passengers obstructing the passage of bullets. And you’re less likely to run afoul of the roving marshal up top — though unless you can corner and punch another outlaw, there isn’t any treasure to be had on the roof. Another thing making it a bit harder to predict what everybody’s up to is the fact that the train occasionally goes through a tunnel. When that happens, rather than playing cards face-up, everyone gets to place one face-down. Because it’s dark, see. Then it’s up to you to decide what in the Sam Hill everyone is up to. Are they following their previous plan, or maybe taking advantage of the darkness to sidle out of danger? Or will they play the marshal card to send the lawman rampaging into a crowd of rival outlaws? It’s tense stuff. Even getting shot can make a big difference. As you get plugged with one lead slug after another, your hand gets clogged with wounds that need tending. It’s possible to skip an action to draw more cards, but, well, then you’re skipping an action in a game where actions are at a premium. Each of these factors are simple enough in their own right, but the sum of all these parts is a surprisingly taut game of wits. When you ambush another player and steal his best diamond, you’ll feel genuinely clever. Not that victory at Colt Express necessarily goes to the smartest player. It emphasizes the hilarity of programmed movement over its more competitive aspects. It’s the sort of game that happily lets you blunder into the marshal’s space three times in the course of a single round, earning the Man With The Most Orifices Prize, or makes you think you have the most loot until it turns out you spent the last round getting robbed by your fellow robbers. Between the planning and the randomness, it seems to me that the randomness wins by a hair — but don’t let that dissuade you, because this is one of the funniest games I’ve played in a long time, full of silly moments and quick-witted dodges. Within my group, it’s proven to be one of those rare gems that appeals to veterans and newcomers alike. Posted on January 16, 2015, in Board Game and tagged Asmodee, Board Games, Colt Express, Ludonaute. Bookmark the permalink. 5 Comments. That final alt text though. I laughed pretty hard at that one. Urban legend or not, it filled me with a warm glow that someone else knows that bit of cinema trivia. 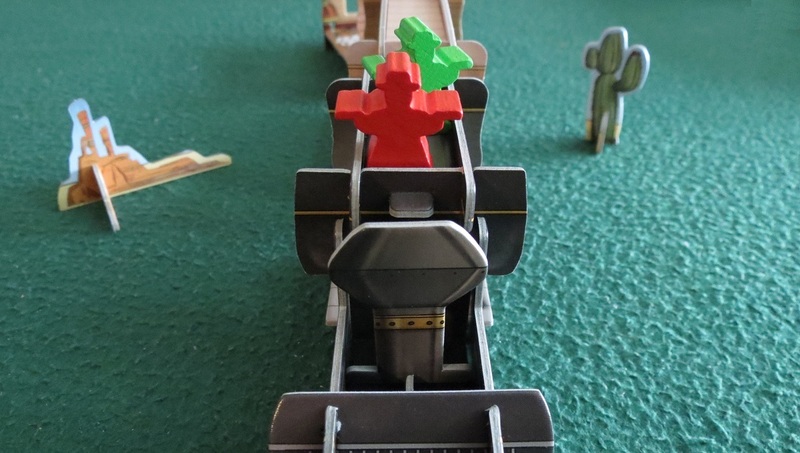 Pingback: Elsewhere: Colt Express | SPACE-BIFF! Pingback: Best Week 2015, Left Over! | SPACE-BIFF! Pingback: Big vs. Small | SPACE-BIFF!